Staining is the method by which natural dyes are created from plants. 2. Clippers (craftable – Tinker menu under the Tools tab). 4. Wine (buy from NPCs). use ‘snake charming’ (snake charming flute made by a carpenter, no music skill needed to play it) take an empty vial (glassblowing) double click the vial, target the snake and ‘milk it’. Kill the serpents, drop rate roughly 1:5. You must first create pigments from plants which you can then mix into the final color you wish your dyes to be. 1. Set clippers to clip plants on their context menu. 2. Use clippers on plant to create plant clippings of that color – this consumes the entire plant. 4. Use a skillet ( with cooking skill) or mortar (with alchemy skill) to transform the clippings into pigments (requires 1 empty bottle). 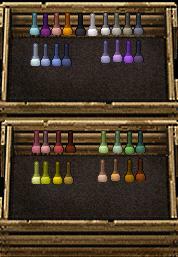 Once you’ve obtained that pigment bottle you can either transform that into usable dyes or mix the pigment with another pigment to try to create a new hue. Simply double-click one pigment and target another that you wish to mix it with. Mixing the colors produces the same results as crossing colored plants, ie red + blue = purple, red + red = bright red etc. In addition each colour can be mixed with white, to give ice red, ice blue etc and black to give dark red, dark blue etc. Black + White = Ice Black, Black + Plain = Metal, White + Plain = Off White. The black and white pigments are deemed to be unstable and can only be mixed by Grand Master alchemists or chefs. The Naturalist colors, aqua, pink, magenta and fire red can not be mixed. You decide not to waste pigments by mixing two identical colors. You decide not to waste pigments by mixing variations of the same hue. This pigment is too diluted to be faded further. This pigment is saturated and cannot be mixed further. 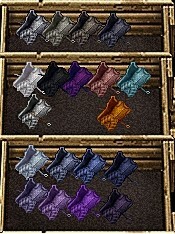 Pigments must be mixed with color fixatives before they can be used to dye items. The fixative is craftable through cooking or alchemy and requires a bottle of wine and 1 vial of silver serpent venom. Once you have mixed the pigment to the color you want and have a color fixative bottle in your bag, use your cooking or alchemy menu to transform your pigment into usable dyes. Each dye bottle has 5 uses. 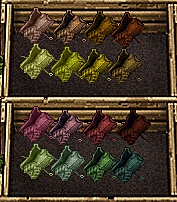 Once made into dyes, you can no longer mix the colors. Top row: Aqua, magenta, Rare Pink, Fire, Black, White, Off White, Plain, Metal, Ice Black. Second row: Ice Blue, Bright Blue, Blue, Dark Blue, Ice Purple, Bright Purple, Purple, Dark Purple. Third Row: Ice Red, Bright Red, Red, Dark Red, Ice Green, Bright Green, Green, Dark Green. Fourth Row: Ice Yellow, Bright Yellow, Yellow, Dark Yellow, Ice Orange, Bright Orange, Orange, Dark Orange.